Following Sohos recent growth from culinary wasteland (relative) to restaurant oasis sees the arrival of 10 Greek Street, another restaurant embracing the British bistro ethic, alongside other recent openings such as 10 Cases and Duck Soup. Unsurprisingly, the focus is on good cooking and good ingredients, and much of what is on the menu illustrates this. The daily menu is scribbled on the chalk boards around the small space, and merely lists a roll call of ingredients. No foams, reductions, jus or fancy language on show, what's on the board is essentially what you get. Everything on the board seems pretty in season and as with all good menus, posed the conundrum of multiple appetising options. 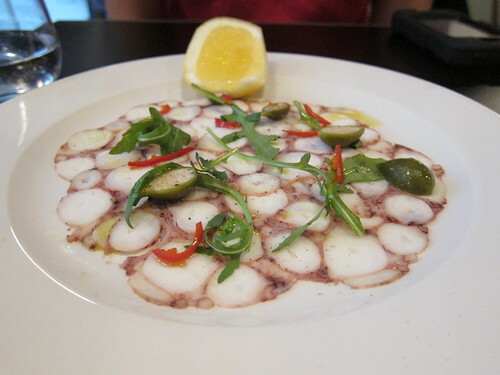 After a quick perusal of the items marked between £5 and £7 (there are no starters or mains here), we opted for octopus carpaccio, caper berries, chilli and lemon which sounded as perfect as it comes. When it arrived, the dish looked like a mosaic of sliced octopus circles, all carefully arranged next to each other, with each piece delicate and full of delicate octopus, lifted by squirts of lemon. The little bursts of heat from stray mouthfuls of chilli, and sour salty bursts from the caper berries enlivened the palate as we discussed how this dish was presented with such precise alignment of octopus rounds. The good start was somewhat diluted by the rather lengthy wait for our mains. Although we munched on good bread and olive oil, all I really wanted was to get my chops around was the wood pigeon I had ordered. Sadly, when it finally decided to turn up, I was disappointed. The kale and jerusalem artichoke they were served with were perfect. The kale still vivid green and buttery, the artichoke cooked through retaining some bite. 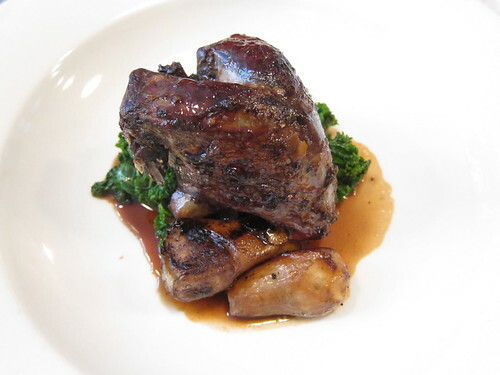 The pigeon looked perfect, and as I had never eaten a whole carcass before, attacked it with great gusto. The minute I struggled to get my fork into it, I knew I was in trouble. Hacking my way around the meat and trying to get away some of the meat off the carcass was a real chore as the whole bird seemed woefully overcooked and tough. We did debate sending it back, but at this stage, I had already been waiting for more than an hour and was pushed for time as I needed to return to the office. I struggled through the firm mouthfuls and lamented what seemed to be a waste of what was still a fairly decent tasting bird. My companions venison had no such issues, being perfectly pink and served on a bed of red cabbage and luxurious, perfectly balanced truffle mash. We had wanted to try the quite lovely looking desserts, but sadly an hour and a quarter later, we were eagerly awaiting to pay and it was over an hour and a half before I had returned to my desk, a mere 5 minutes away. 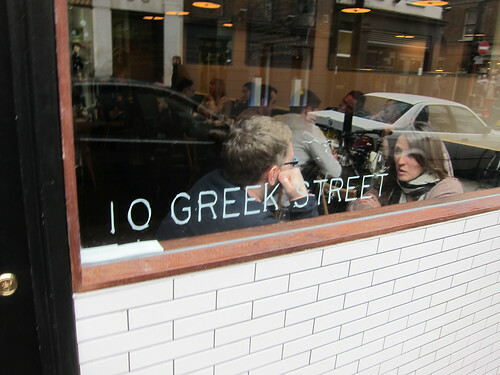 10 Greek street is not a bad restaurant, far from it, but there were just too many things which really annoyed me. Firstly, the staff are lovely, but having booked two hours earlier over the phone, the front of house was unable to locate our booking upon arrival. Luckily there were a few spare tables, otherwise we would have been some rather peeved punters. Secondly, it was very slow, and sadly for a lunch time crowd in Soho, the turnover really needs to be faster. For three dishes taking over an hour from ordering to turning up (one being a cold dish), this is pretty unacceptable. Thirdly, if the main ethos of your cooking is fantastically sourced dishes, put together simply, please make sure you don't ruin the main protein. Overcooking a wood pigeon where 5 minutes of hacking yields a thumbsize portion of digestible meat does not constitute an enjoyable lunchtime. Finally, and probably my biggest gripe, sort your extraction system out, as by the time I left, we were straining through a haze of animal fat and I left smelling tantamount to a greasy kebab shop. All being said, I thought most of what I ate at 10 Greek Street was very good, and has all the hallmarks of a good restaurant. I saw enough to make me want to return, but for me, there were some serious issues that need attention. Next time, please don't lose my booking, please make sure you don't ruin my meat, and most of all, please don't let me leave your restaurant smelling of a bad chip shop. You've echoed my sentiments pretty much exactly. I'm willing to give them another chance since they're quite new, but by god I kiffed all afternoon. I had similar problems in Duck Soup and I wonder if it's the downside to the 'small/big plates' restaurants. No set order of dihes and an assurance that dishes will arrive when they're ready, meant we had a flood of dishes, then a couple that didn't turn up for ages. The relaxed, informal thing is lovely in theory but when you don't have hours to linger, it gets a bit annoying.